It's March! Can you believe it? It doesn't seem too long ago that we were all knee-deep in holiday baking, shopping and celebrating. And, now here we are coming into springtime. I know I am more than overly ready for warmer weather! Can I get an amen, friends? February was a record month here on Joyously Domestic. We had an insane number of visitors to the blog. And, our social media followings grew by leaps and bounds this past month. So exciting. Thank you. Did you miss any of these recipes? 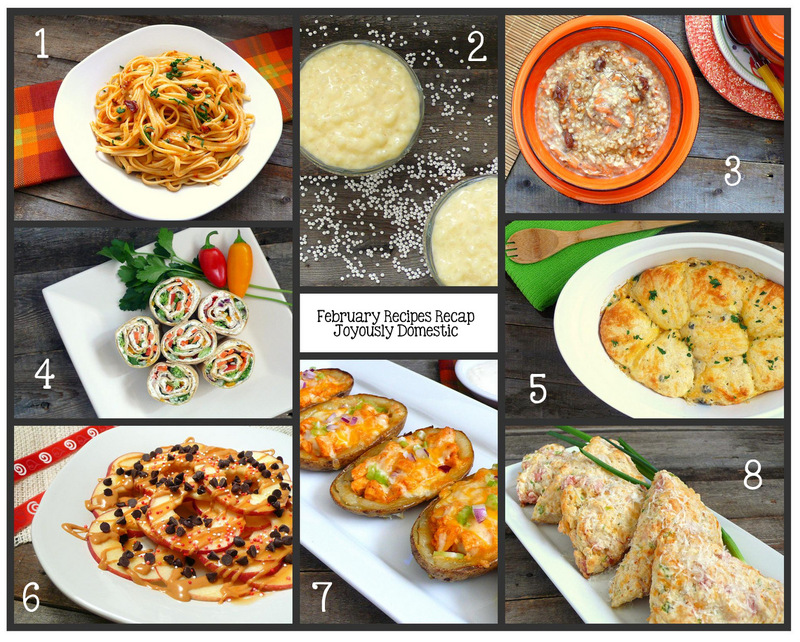 Here's look back on the February yumminess. 1. Not a whole lot compares to a heaping plate of perfectly-cooked pasta. My Pasta with Sun-Dried Tomato Pesto was a real winner in the Joyously Domestic household and I'm sure it would be with your gang, too. 2. Forget those store-bought pudding cups ... this from-scratch version is the way to go. My Old-Fashioned Tapioca Pudding couldn't be easier and utilizes only a handful of basic ingredients. 3. Wake up to one heck of a hearty breakfast with this Slow Cooker Carrot Cake Oatmeal. It has all of the flavor components you love in carrot cake, but in oatmeal form. 4. Move over crescent roll veggie pizza ... these Veggie Confetti Wraps taste just like the original version, but all rolled up into cute pinwheels. And, you'll ditch a ton of the carbs using the Lavash bread I used in this recipe. 5. Everything you love about breakfast combined into one convenient casserole. My Sausage Gravy and Biscuits Breakfast Bake has it all - cheesy eggs, sausage gravy and fluffy biscuits. 6. Caramel, peanut butter and chocolate collide atop sliced apples in my Loaded Apple Nachos "recipe." Your kids/grandkids will love it and so will you! You're just five minutes away from enjoying this gooey, mouth-watering snack. 7. Potato skins - we all love them. But, these Buffalo Chicken Potato Skins are an amped-up take on traditional skins. They are the perfect combination of zip and cheesy goodness. 8. As a longtime fan of sweet scones, I have fallen just as much in love with savory ones recently. These Ham and Cheddar Scones are tender, flaky and so full of flavor. They're fantastic with soups or even toasted and spread with butter. 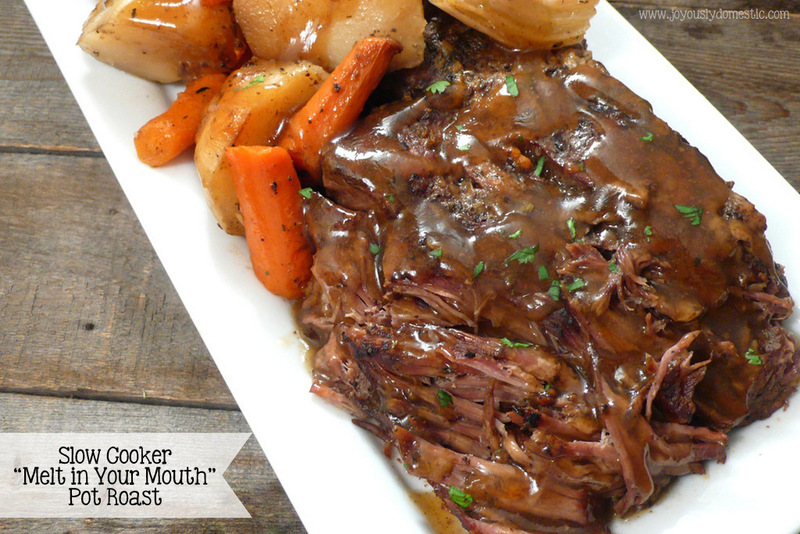 A super gigantic thank you to The Slow Roasted Italian for sharing my Slow Cooker "Melt In Your Mouth" Pot Roast a few times last month on their Facebook page. TSRI helped make it our most-popular post in February. And, a big thanks to a couple of Facebook recipe sharing sites - MB Things I Know and Incredible Recipes - for sharing several of Joyously Domestic's posts this past month. Have you been over to Teal & Lime lately to check out my appearance there as a monthly contributor? Jackie invited me at the beginning of the year to begin a year-long guest series - Kitchen Made Simple - on her site. I'll be sharing organizing tips, fun printables, homemade gift ideas and maybe some recipes along the way. In February, I shared my Weekly Menu Planning Essentials. Check it out ... the post includes a FREE printable to make menu planning super easy. Are you on Pinterest? If so, I'm totally loving our newly-created Bacon Love and Cheesy Goodness boards. 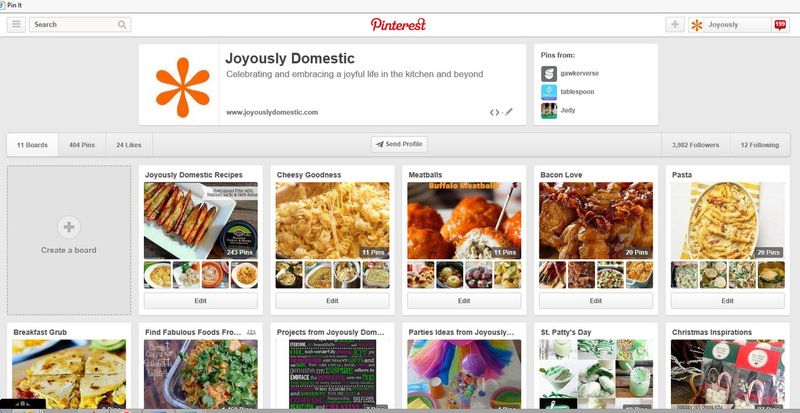 Come on over and follow Joyously Domestic - I'd love to have you join us! And, speaking of Pinterest ... I've just started a St. Patty's Day board that is sure to inspire this month! I have a lot of fun, new recipes planned for March. And, I'm working on a great post coming up this month for my Kitchen Made Simple series on Teal & Lime. (It's all about how I tackled my spice collection that was so incredibly out of control.) I've, also, got some giveaways planned for between now and early-summer. So, stay tuned! On a more-personal level, it's gonna be one heck of a busy month on the home front. Our schedule is a hectic one these days - our fourteen-year old is in the midst of driver's training classes right now (seventeen classes in twenty-one days - yikes! ), and we've got lots of school programs, sports activities, play practices and two of our children have birthdays this month. Thank goodness summer break is (slightly) in slight! Maybe if I squint hard enough (or get out the binoculars), I can see visions of pool-side lazy days, cook-outs and flip flop weather ... 'cuz this is what it still looks like here in our neck of the woods in Michigan. Have a fabulous March! Stay safe and warm, my friends. 14 year olds can drive in Michigan?